NOTE: Out of an abundance of caution and safety, ALL activities – meetings, rehearsals, practices, gatherings, assemblies, etc. at St. Michael’s are CANCELLED for Tuesday afternoon/evening February 12, 2019. 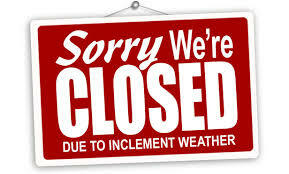 The parish offices will CLOSE at 12:00 Noon on Tuesday – unless an earlier time is deemed necessary – for the safety of all staff members.